Identifying Fashion is a monthly column by Susan Myer Silton, which asks people with a unique fashion footprint how fashion shapes their identity. When I asked Farrar how fashion shapes her identity, she answered, "How does fashion shape my identity? Or … how does my identity shape fashion? My grandmother once wisely said, 'Look the very best you can before you leave the house. Then forget about yourself.'" She continued, "To this day I live by this axiom. Fashion, ultimately, offers me a sense of freedom and confidence as I enter and exit the world daily. It has always been a fun, instinctual and unencumbered creative world for me. It allows me to exist with a physical expression of individuality and functionality, both qualities I strive to manifest in all arenas of life. When I feel properly dressed I can forget about myself, quite literally, and engage gracefully with individuals and activities in the outside world. No tugging, no fidgeting, no comparing. Rather, more space for listening to and seeing all that’s surrounding me and being interested and present with it all." 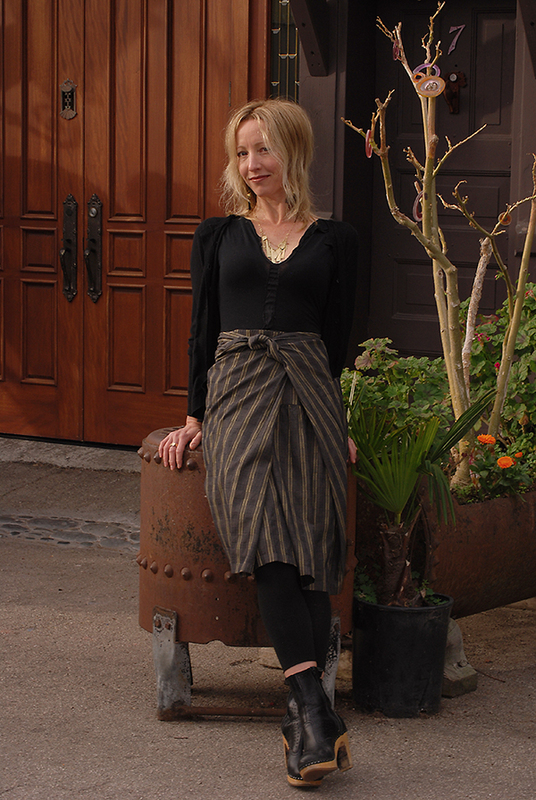 Farrar is pictured in front of the wooden double doors of Art du Jour. Above, Farrar is wearing: Marni cardigan, similar here. Loyandford tee, similar here. Dries Van Noten skirt, silmilar here. Swedish Hasbeens boots, similar here and here. 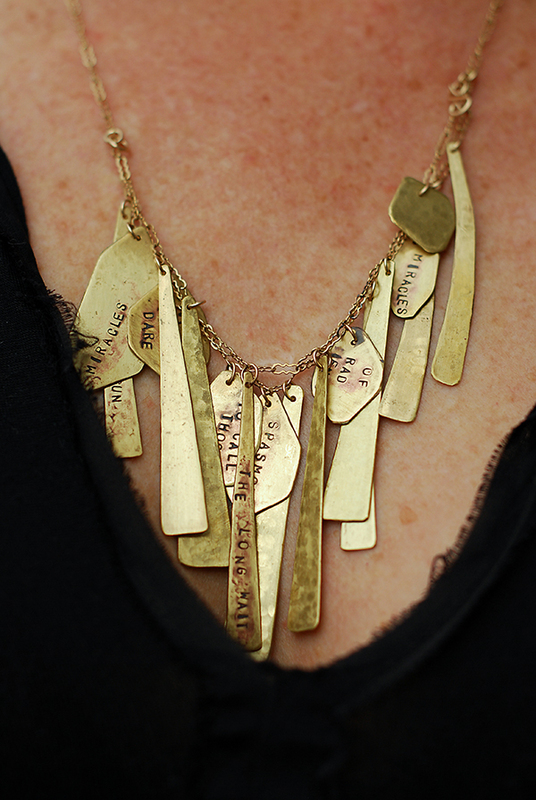 One-of-a-kind necklace of brass and other metals, made by Farrar and stamped with the last two lines from the Sylvia Plath poem, "Black Rook in Rainy Weather." Find similar necklaces by contacting Farrar at (831) 247-0750. Farrar is standing in front of Bare Studio, a multi-service body aesthetics salon. Photo by Jose Estevez. Farrar is wearing: American Gold tunic, similar here. Vince Jeans, Style DV 135-2102, asphalt, similar here. Chloe wedge boots, from therealreal.com, similar here and here. Earrings of brass and other metals, designed by Farrar. 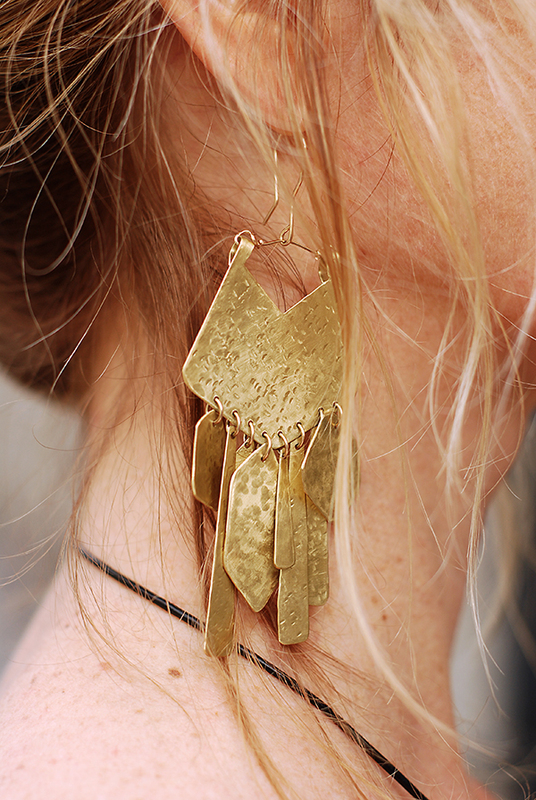 Find similar earrings by contacting Farrar at (831) 247-0750.